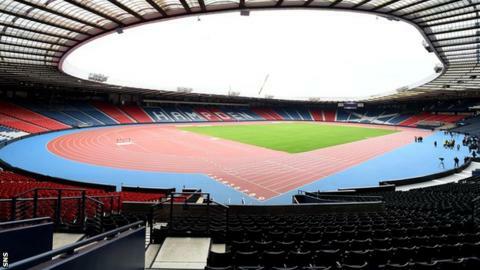 Hampden has been chosen to host games as part of the European Championships in 2020, Uefa has confirmed. The Scottish FA bid for Glasgow to be one of the 13 cities that will stage games during the competition, which marks the 60th anniversary of the European confederation. "It's fantastic news for Scotland and for Scottish football," said SFA chief executive Stewart Regan. Hampden will stage three group stage games and one last 16 match. Wembley Stadium in London was chosen to host the semi-finals and final. Ireland's Dublin Arena was also selected to host games, but Wales' Millennium Stadium was not. Glasgow was the last of the host cities to be revealed at the announcement in Geneva. "As we got to that final ball I thought 'this is between us or Cardiff' and when (Uefa president) Michel Platini lifted the first corner out of the envelope and I saw the 'G' I nearly leapt out of my seat," Regan told BBC Sport. "You know what kind of party Glasgow can put on. "If you look back at the Commonwealth Games, the people of Glasgow will make it a great party. "In 2020 we have the opportunity for some of our kids at our performance schools to get right the way through the age groups to the national team at Hampden Park for a tournament that we qualify for. "That is the vision and there is a lot of work to put in to getting us there." Munich (Germany), Baku (Azerbaijan), Rome (Italy), St Petersburg (Russia), Bilbao (Spain), Bucharest (Romania), Brussels (Belgium), Budapest (Hungary), Copenhagen (Denmark) and Amsterdam (Netherlands) are the other cities that will host games as part of Euro 2020. Stockholm, Skopje, Jerusalem, Sofia and Minsk were the other cities to miss out. Uefa president Michel Platini, who was behind the idea to share the tournament across Europe as part of the 60th anniversary celebrations, revealed the successful bidders in Geneva on Friday.